Capt. James Cook (1728-1779) - There are many great sailors in British history. There are also many great explorers in world history. Captain James Cook was both. A great explorer and one of England's greatest sailors. Born in the town of Marton about 20 miles inland, as a teenager he moved to the coastal town of Staithes where he became a work shop apprentice. He wasn't cut out for such work though and left to become another apprentice, for the merchant navy. He literally started at the bottom, shipping coal to towns along the English coast. But he also devoted his time to learning higher naval skills such as astronomy and navigation, which would serve him well later in his career. He advanced through the ranks of the merchant navy and became an officer; but in 1755 he decided to leave the civilian side and join the Royal Navy, despite the fact that he would have to start at the bottom all over again. However, he joined just before the outbreak of the Seven Years' War between England and France, which gave him the opportunity to gain combat experience almost immediately. At the start of the war, he served aboard the HMS Eagle which captured one French ship and sank another while patrolling European waters. In 1758 he was transferred to the American theatre, his first time to the New World. There he took part in the capture Fort Louisbourg, and the assault on Quebec City. It was at this time that he displayed his talent for surveying and cartography. He made detailed maps of Newfoundland and the mouth of the St. Lawrence River which aided England against the French. After the war, Cook turned to exploration. The Royal Navy made him a lieutenant and commissioned him to lead an expedition into the Pacific. In all, he made a total of three worldwide voyages between 1768 and 1779. On his first, he circumnavigated New Zealand and reached the east coast of Australia. Upon his return he was promoted to the rank of Commander. On his second voyage, he crossed the Antarctic Circle in 1773 and received a promotion to Captain. And on his third voyage he reached the Hawaiian Islands, becoming the first European to do so. His ship for the second and third voyages was the HMS Resolution. But that was as far as he got. He survived the first trip in 1778, but returned a year later and was killed by the Hawaiians after a conflict with King Kalani'ōpu'u. 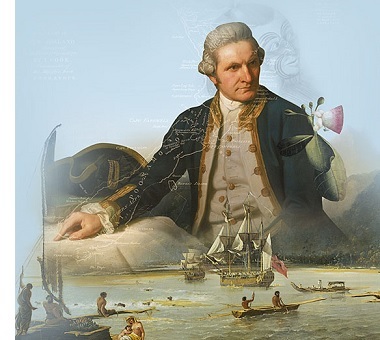 Captain Cook kept detailed journals of his voyages which were published making him and several of his crew members quite popular among the British public.